Assemblyman Troy Singleton swears in Joyce Howell at the January 2017 reorganization meeting. 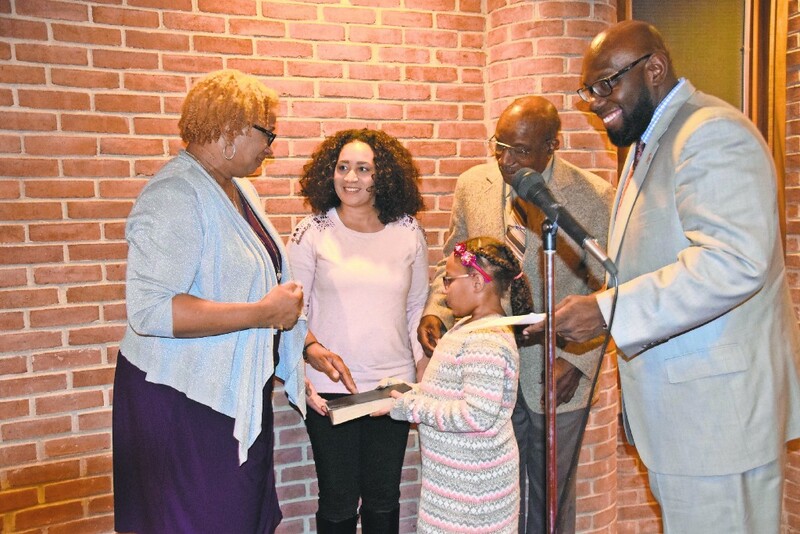 Howell, pictured with her daughter, Nicole Butler, her granddaughter, Coryn Butler, and her father, Clay Howell, is the first African American woman to serve as council president in Burlington Township. Burlington Township Council chose Joyce Howell to serve as council president for 2017. Howell is Burlington Township’s first African American woman to serve as council president, and she will replace Carl Schoenborn, who served as president for 2016. Council voted unanimously to elect Howell as president, and all members of council expressed pleasure in electing her. Council chose Michael Cantwell as president pro tempore. Assemblyman Troy Singleton swore in Howell along with re-elected council members E.L. Pete Green, Robert Jung and Patricia Siboczy. Attorney Eric Schoenborn swore in his father, Carl Schoenborn. All four members ran unopposed in the 2016 election. Schoenberg received the most votes with 6,582, 25.60 percent of the total vote. Green received 6,457 votes, 25.11 percent, Siboczy received 6,343 votes, 24.68 percent, and Jung received 6,300 votes, 24.50 percent. Before departing, Singleton expressed his gratitude to Burlington Township, calling it one of the finest towns in New Jersey. Singleton is responsible for representing 17 communities. Mayor Brian Carlin began his greeting by saying he is proud to serve with what he believes to be the best governing body in the state. Carlin presented a plaque to outgoing Planning Board President Charleen George for her 37 years of service on the board. “She was here as a member of the planning board when this town went through historical growth. It went from a small farm town to the diverse suburban community that we have today,” Carlin said. Cantwell also spoke on George’s contributions. Carlin highlighted the accomplishments made by Burlington Township in 2016, which included completing a township-wide re-evaluation, improving the relationship between the police department and the community, updated infrastructure and a new sewage plant operator, among other things. Going into 2017, Carlin aims to “do more with less” by using cost-efficient ways to provide needed updates in the town. Carlin also addressed the Neck Road concerns, saying council will be meeting with county officials to discuss possible solutions. More than a dozen community members came to the Nov. 22 council meeting to express concern over the illegal truck traffic on Neck Road. Carlin said he is also anticipating the completion of the new lighting installation in the baseball field, softball field and hockey court at the Skimmer Adams Complex.